Jim, I guess that makes us both members of the old timers club. I so agree Bill Young. I know Sunguar. I'm just being a smart aleck. A springtime SiP...now that does sound like a great idea Bill Cotter. 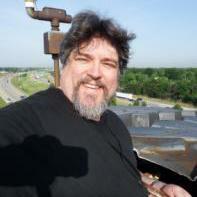 Good times and bum times, I've seen them all and, Sunguar, I'm still here.....since September 10, 2000! It's a aircraft hazard beacon. There is also another one at the top of the New York State Pavilion towers. Bill, I'm glad you didn't pass this one up. It truly is a great find. Congratulations! Very nice Bill. What a find! I can add that the last one I saw on eBay received 28 bids and sold for $898.88 on 11/24/13. Yes, I remember someone saying on here it was true. I also seem to recall that a low three sided railing was added in 1965 for this very reason. Maybe someone else on the board can confirm my recollections. I knew I had seen this somewhere recently! 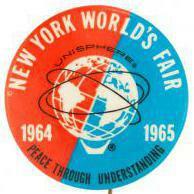 It was on the Facebook group titled "The New York World's Fair (1964/1965)" from a post by Dorothy Condon on 5/16/18. Dorothy posted that it's called a "Salute to the World's Fair Flower Arrangement" according to the box. Her post has three photos of this same piece. The barriers are no longer there. You actually were standing more to the right and a little farther out. I've seen one before, I think maybe on eBay. The following bits of information were gleaned from the Fair Corporations records at the New York Public Library during one of my many fact finding missions over the years: Robert Moses entire Yale graduating class of 1909 was invited. Robert Moses lamented the passing of his fellow classmates. One assistant to Roberts Moses said remove a name from the list because "He's dead." Fair officials were very concerned that President Lyndon Baines Johnson wouldn't come to the opening ceremonies. Former President Eisenhower wouldn't come from Palm Springs because it was "Too much of an effort to travel across the country". Fair officials asked him to write a statement, which he did. Former President Hoover was too frail to come. He was also asked to send a statement. Former President Truman was in attendance and did speak. President Johnson's assistant (possibly Kenny O'Donnell) actually asked fair officials to move the opening date of the fair to 4/20 to accommodate the president’s schedule. Fair officials politely declined by explaining that was just not possible given the complexities involved. Fair officials debated whether or not to invite Grover Whalen's widow. They did and she wrote a very grateful thank you letter to Robert Moses. Many people made personal pleas for tickets to the opening ceremonies and fair officials went out of their way to accommodate most, if not all of the requests. The invited guest list quickly grew from 5 to 10 to 15 thousand people in the last 2 months leading up to opening day. Fair officials were very concerned about how it would "appear" if the former or current presidents didn't all accept their invites. Fair officials worked with presidential intermediaries to get a feel if The White House would accept if an "official" invite was sent. The letter sent to President John F. Kennedy on 11/21/63 about attending the fairs opening had a note attached to it dated 11/22/63 saying that it was retrieved from the mail room before it could be sent. A two thousand guest official party was planned for the Top of the Fair restaurant, but it was canceled once fair officials found out that President Johnson wouldn't be attending. Robert Moses table at the official party would have been 11 people instead of 10 at all the others. The centerpiece on Robert Moses table at the official party was to have been a certain kind of flowers in a round black basket. Fair official (possibly Ernestine Haig) pointed out that the fair is the star of the show, not any politician that the public can see on TV at any event or holiday. Anyone know what was behind this act of vandalism? If I recall correctly, Jackie Kennedy personally arranged for the Mona Lisa to be exhibited here in the U.S. (on loan from the Louvre) because the French people were very taken with her after she visited France with her husband in 1961. But allowing the Mona Lisa to actually leave France also caused quite a stir back home, such that I think the French government later passed a law that said the painting could never leave France again. Obviously the Vatican didn't feel the same way, since they did allow the Pieta to be exhibited at the Fair over some Italian objections.